THIS RESTAURANT HAS CHANGED NAMES TO AMERICA EATS TAVERN. 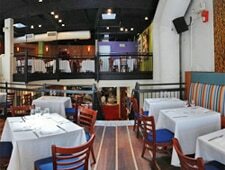 Terrific Latino fare in jazzy surroundings. : THIS RESTAURANT HAS CHANGED NAMES TO AMERICA EATS TAVERN. With a culinary vision provided by chef José Andrés, it's no wonder that Café Atlántico continues to attract DC's food- and fun-savvy. This dramatic three-level restaurant, installed in a former power plant, incorporates a downstairs bar known for its colorful and powerful Latin American cocktails. Start with a caipirinha or a mojito. The cuisine features updated versions of Latin American classics, such as scallops with coconut rice, Veracruz-style red snapper, and Brazilian stew with chicken breast and pork-bean mash. For the best in self-indulgence, don't miss the weekend brunch---appropriately dubbed a Latino dim sum---a nonstop eating fest. It includes small portions of such dishes as duck confit with passion fruit oil, and tuna ceviche with coconut and mango-anchovy ravioli salad. Ask about the chef's special menu, for entire tables only. Upstairs, the ultimate in gastronomic indulgences comes at Andrés's Minibar, an eight-seat restaurant with its own staff urged to create whimsical, deconstructed dishes that are as much about science as about gastronomy. They push the envelope with a tasting menu that is inspired by their imaginations and what's really fresh and unique for a total of 30 to 35 dishes at a seating. Don't worry---the portions are bite-size. The wine list is as unconventional as the menu, a great pairing. But don't tarry: you may face a two-month wait to get a reservation.